Former MLB star Lenny Dykstra was arrested in May 2018 following a dispute with an Uber driver. 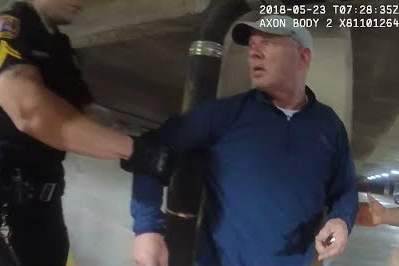 Authorities in Linden Township have released body cam footage of the arrest of former Philadelphia Phillies star Lenny Dykstra following his dispute last month with an Uber driver. Dykstra, 55, was arrested May 23 after police were called to a parking garage to investigate the Uber driver's claim that a passenger allegedly had threatened to kill him. Authorities ultimately arrested Dykstra for alleged possession of cocaine, MDMA and marijuana. The Uber driver told police that Dykstra, who owns a home Linden, allegedly held what seemed to be a gun at the back of his neck. In his own account of the incident, Dykstra claims the Uber driver lost his temper after the former centerfielder tried to change the destination of the trip. At that point, Dykstra said, the driver began speeding and locked him inside the vehicle. Police charged Dykstra with making terroristic threats and several drug offenses. He has previously served time in prison for bankruptcy fraud and money laundering. A report from TMZ late last week claimed police had charged the Uber driver with false imprisonment. Dykstra said at a press conference last week that he had attempted to call police several times from the Uber and feared for his life when he was inside the vehicle.